Finding the roots of the cubic equation ax^3 + bx^2 + cx + d = 0 can be a challenge. Even with a cubic formula, multiple and sometimes complicated steps can be involved. 1. Find the first root X1. 2. Use X1 to invoke synthetic division to reduce the cubic equation to a quadratic equation. 3. Use a modified quadratic equation to find the other two roots. The link provides good formula for finding the remaining two roots. I assume that the coefficients a, b, c, and d are real numbers. This guarantees that one of the roots (X1) is a real number. Once X1 is found, symmetric division is used to reduce the cubic equation to a quadratic equation. The roots X2 and X3 are now found. If A, B, C, and D are real numbers (no of the coefficients has an imaginary part), X1 will be a real root. X2 and X3 will either be two real roots or conjugate complex numbers. 2. I use a trigonometric work around when .25 * (P^2 - 4*Q^3) 3. Notation wise, SQR stands for square root, ABS stands for absolute value, and ANGLE is the angle function ( atan2(x,y) ). 4. All the used variables are "destroyed" to clear them and assign them to real numbers. 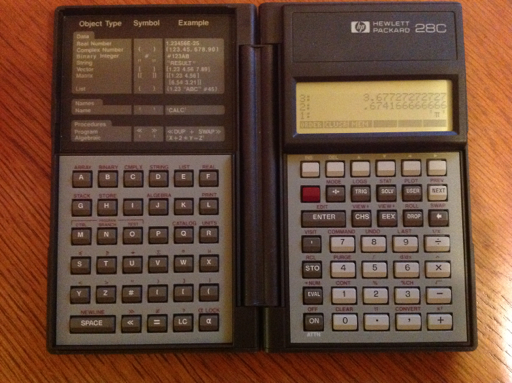 Last Sunday at the Azusa Swap Meet, I purchased the HP-28C and HP-48GX calculators for less than $10. What a lucky day. The batteries cost more than the calculators. * Battery compartment was a struggle to open. * Only 1,614 bytes of memory (net) on the 28C. More than the Casio fx-7000GA, but less than the Texas Instruments TI-81 (2,400 bytes). This blog entry is an extension of the list of programs made with the Casio fx-6300G and the fx-7000GA. 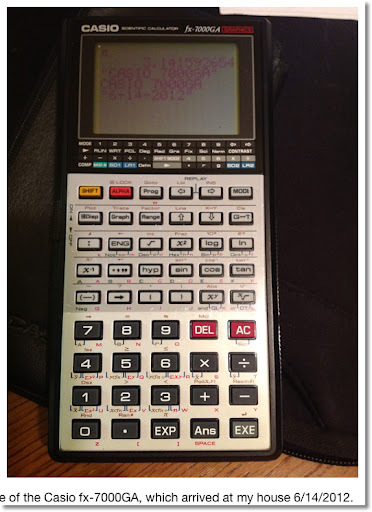 Most of the program steps can be transferred verbatim to today's Casio graphing calculators. Pol( and Rec( on the fx-6300G and fx-7000GA returns results in variables I and J. I gets r and x, respectively while J gets y and θ, respectively. The fx-9xxx series (at least the fx-9860 series) returns the conversions from Pol( and Rec( as lists. Adjust accordingly. However this list of programs will bring more of the complex features offered by today's higher-end calculators. The batteries run out on the fx-7000GA fast, or maybe not. It seems to work well after hours of rest. The programs listed (except for the Quadratic Formula program) on this blog requires a second program, which I designated Program 0. I use program 0 to store my function. The difference quotient method is used with Δ = 10^-5. Accuracy may vary. Machine accuracy not guaranteed. I modified the program in the Casio fx-6300G handbook, to try to make it shorter. N must be even. I is the integral. Note: You will have set up the Range in advance which takes intuition, knowledge, and maybe luck to get a "perfect" graph. Once the Range is set up, as I understand it, the graph screen clears. Note: You will have set up the Range in advance which takes intuition, knowledge, and maybe luck to get a "perfect" graph. Once the Range is set up, the graph screen clears. I had better luck with this program on the fx-6300G than on the fx-7000GA. Note: these are dot plots and are not traceable. I tried using SD2 mode (Scatterplot Mode) but was not able to use comparison commands. Also Line is not the command that it is today. Preload A, B, and C before running! I leave you with some graphs. Here is a list of programs I did over the course of the last few days (since 6/14/2012). These programs were done using the Casio fx-6300G and fx-7000GA calculators. These programs can be ported to almost any Casio calculator that has programming. Note: for the fx-3650P, there are no strings, graphics, and variables are limited to A, B, C, D, X, Y, and M.
If you need summary of the programming commands, check out this page. **You can shave off steps by pre-storing all the variables before execution and leaving out some the beginning prompt commands. I do that in some of these programs. Uses the polar form of the complex number x+yi to find the n roots of it. Pol(x,y) stores r in I and θ in J.
Rec(r,θ) store x in I and y in J. For the fx-9000s series (i.e. fx-9860), lists are returned. Adjust accordingly. If Z = 0, the matrix is singular and only the determinant is displayed. I finally got my hands on it! 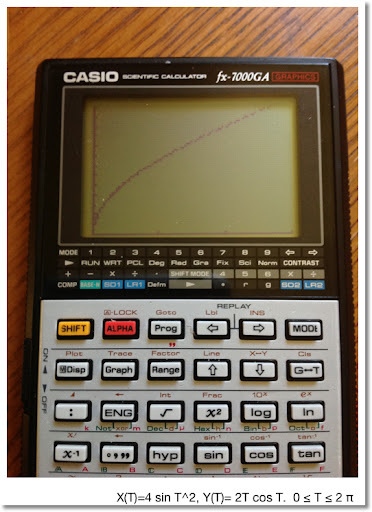 The Casio fx-7000GA calculator. OK, it is not the original fx-7000G that launched the world of graphing calculators, but it is the second edition of it. The 7000G was originally launched in 1985. After some research, i found that the fx-7000GA was first launched in 1990. The fx-7000G series continued with the fx-7000GB (1992) and the fx-7200g (1986). This series is like the Texas Instruments TI-83/84+ family (1996-present), except that the latter family eventually added flash ROM and textbook math input on its later models. 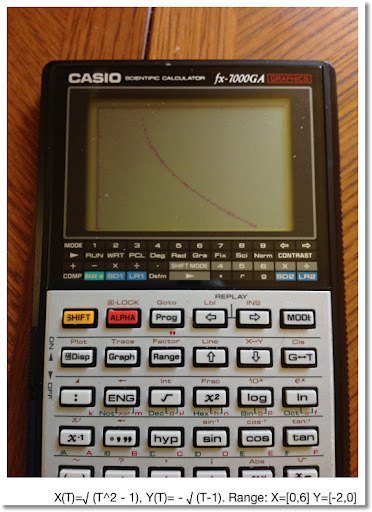 I spent a week playing with the Casio fx-3650P, a solar programming Calcualtor that is sold today (had to buy one off of eBay). And being a collector, the fx-7000G is on my wish list. The fx-7000GA arrived at my house on 6/14/2012. I was bummed at first because the calculator acted weird. Thankfully, three fresh CR2032 batteries later, the calculator is back in working order. However I read that the batteries get used quickly. Bummer. I am amazed on how light the fx-7000GA is. I was expecting a heavy machine, being one of the first graphing calculators to ever be mass produced. 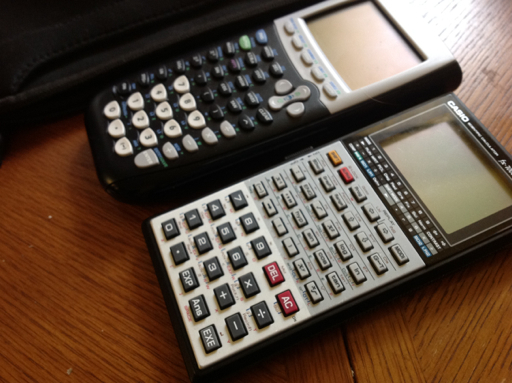 However the calculator is thin, which hopefully you can see in a picture comparing the fx-7000GA and the TI-84+ below. The fx-7000G's smaller cousin, the fx-6300G, which I got several years back in Hollywood, CA (new of the box! ), has only 400 program steps but adds the XNOR function. The fx-6300G has a lot of clones. The programming language is a simple, tokenized one. Tokenized means that symbols and characters are used instead of words to symbolize commands. This minimizes the memory used in programs. 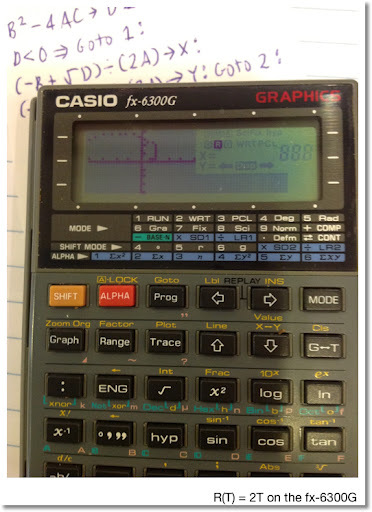 This type of programming language is prevalent in today's graphing calculators from Casio. It also requires us bloggers to purchase and use Unicode apps to get these symbols. : This colon separates commands.
? Input Command. The calculator prompts for a value. "prompt message"? Input Command with a prompt message. ◢ Output Command. The calculator stops and shows output. Continue the program by pressing EXE. On the fx-3650P and fx-6300G, when ◢ is encounter during program execution, the calculator stops and a Disp indicator is present. Goto n The Goto command, n is any number 0-9. Lbl n The Label command, n is any number 0-9. ⇒ The Jump command. This is the basic If-Then-Else structure. On the fx-7000G and fx-6300G, the command is entered by pressing SHIFT, 7. Isz and Dsz Increase and decrease a memory, by 1, respectively. This is akin to the For-Next loops. Syntax is the same for Dsz. This small calculator packs a lot of punch. 8 digit that converts to 5 digit with 2 digit exponent any time the number exceed eight digits. Features include reciprocal, polar/rectangular conversion, one variable statistics, and decimal-DMS conversion. 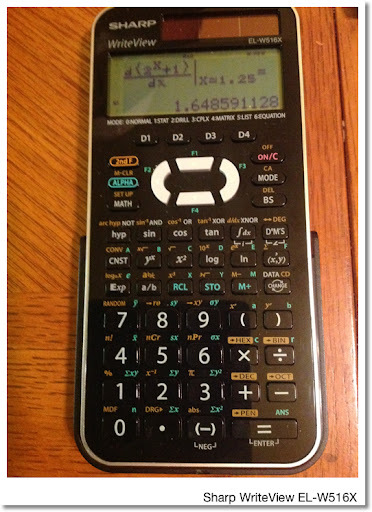 When I had the TI-25X the first time, back in the late 90s, it was my go-to calculator for quick calculations. I just bought another one from Amazon a week ago. The calculator is truly solar, that is no batteries are used in any operation, which is rare in solar scientific calculators. (The battery, I think, aids long-term memory storage). The trouble with the 25X was protecting it. It now lives in a small camera case with bubble wrap around it when not in use. I wish Texas Instruments was still manufacturing the 25X. This is my favorite calculator Casio has produced. 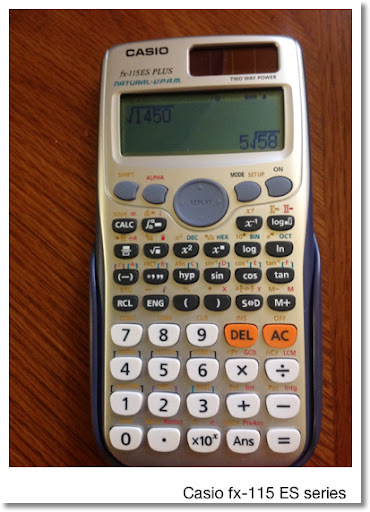 Not only the calculator operates on solar power, but it also was the first (I believe) calculator to have calculus functions: integral, derivative, and sum of a function. Matrices and vectors are also featured. The calculator can solve equations in one variable. Entry of mathematical expressions is straight forward. 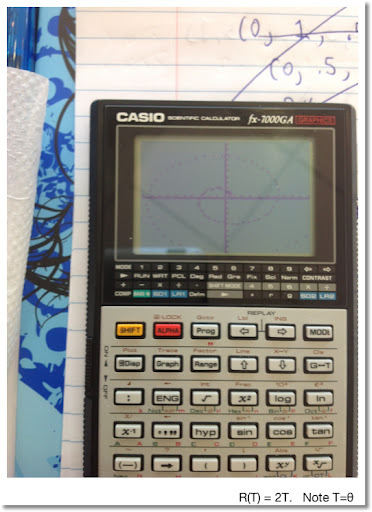 You can set the calculator to textbook entry mode or linear (classic) mode. I prefer the latter (the less pairs of parentheses I have to track the better). The 2012 revision, fx-115ES PLUS (pictured), adds, among other things, integer factoring, verification tests, and product of a function. 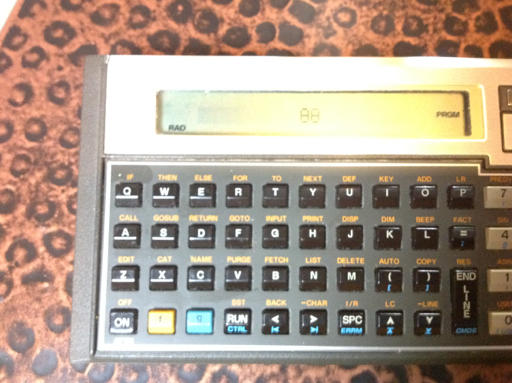 Outside the United States, this calculator is named the fx-991DE/ES (PLUS). * Time Value of Money, using periodic interest rate. I gave my BA 35 Solar to my dad and he loved using it. Unfortunately, the display went nuts and it had to be retired. 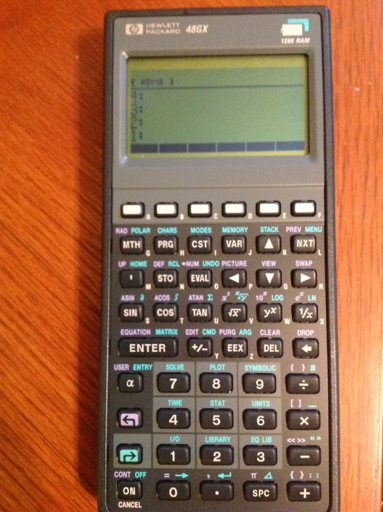 If you wanted the most advanced non-graphing calculator, you pretty much went for the TI-36X series. The original TI-36 Solar was powerful non-programmable calculator which had base conversions, hyperbolic functions, normal distribution calculations, and complex numbers (limited to arithmetic). When Texas Instruments upgraded the 36 to the 36X, the normal distribution calculations and complex numbers were dropped, but eight scientific constants, eight metric-English conversions, and linear regression were added. This calculator received a lot of use during my days of middle and high school. I owned the original 1993 design and it went with me everywhere I went. The solar panel was punctured by a pencil and it died. 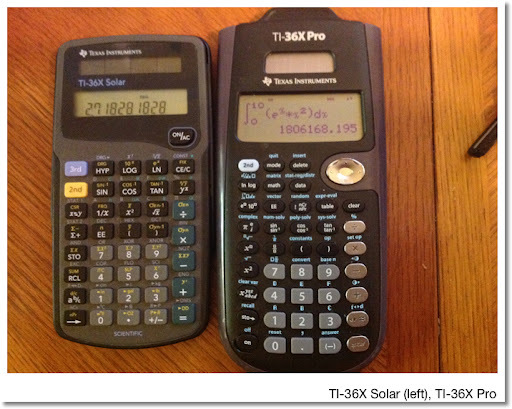 Eventually, I got the 1996 design (pictured) and is my favorite design of the TI-36X Solar. 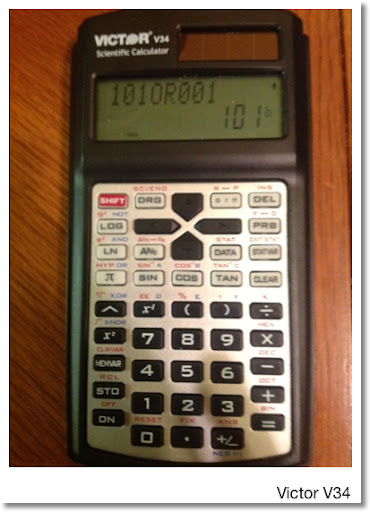 Texas Instruments redesigned the calculator in 2004, giving it a gray faceplate and white keys, which I also have. In 2011, Texas Instruments released the TI-36X Pro (named TI-30X Pro in Europe), which a serious upgrade of the 36X series. New features include derivatives, integrals, tables, equation solver, and entry in textbook format. For me, I had to get used to the keyboard because a lot of the keys cycled through functions. An example: the sine key (sin, sin^-1, sinh, sinh^-1), math constants ( π , e, the complex number i ), and the key that annoys me the most, the variable key (x, y, z, t, a, b, c, d). If you waited to 2012 to consider getting a TI-36X Pro, you did a good thing in waiting. The early versions were buggy and were erroneous in calculations involving π and fractions. Thankfully, TI fixed the bugs and now I can confidently use the TI-36X Pro. Casio fx-3650P: 2002 - present? 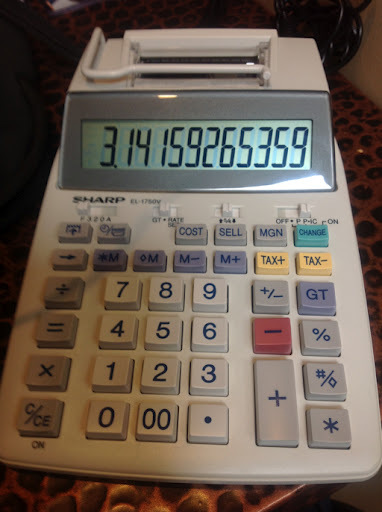 Casio, I think, is the only manufacturer of calculators left that produces programming calculators that also operate on solar power (with battery). I purchased this calculator on eBay (unfortunately it is not sold in stores in the United States, it should be IMHO). The calculator has 360 program steps on which 4 programs can be stored. The programming language is a simplified set of the programming commands found on the Casio fx-5800p and its graphing calculators. Commands include LABEL, GOTO, basic testing, input prompt, and output. Other features include complex number arithmetic, base conversions, and Numeric integrals. Take a good loom at this calculator. 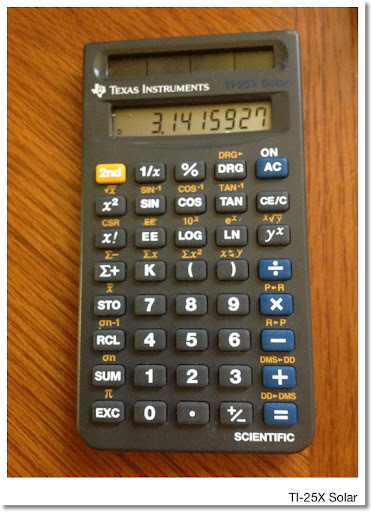 If this calculator reminds you of the super popular Texas Instruments TI-30X IIs, it is because the keyboard design is similar. While the TI-30X IIs sold in many colors for the 2009, 2010, 2011, and (I&apos;m expecting) 2012 back to school seasons, the Victor V34 offers a feature that the TI-30X IIs doesn&apos;t: base conversions and logic operations. 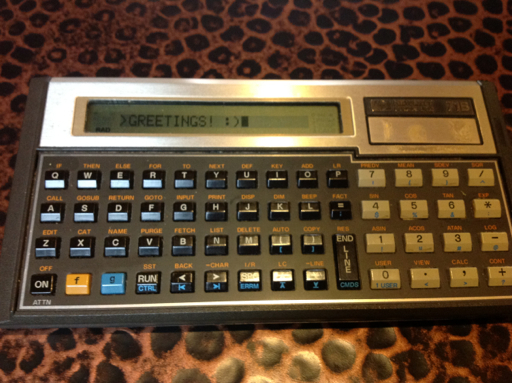 I purchased this hard to find calculator in a local stationery store in Glendora, CA. There are two functions two versions. The original had a gray faceplate. Sometime in 2011(? ), Sharp made a design change and made the entire plate black. The model is now the EL-W516X with black keys, white, green, and gold lettering. In the United States, the Sharp calculators can be found at Target stores. Like the Casio fx-115 ES, the Sharp EL-W516 series offers entering calculations in textbook format. Unlike the fx-115ES where you can get exact or approximate answers when demanded, the EL-W516 forces you to cycle through the format of the answers (exact/mixed fraction, improper fraction, decimal approximation) with the press of the CHANGE key (this applies to Normal mode). Printing calcualtors, better known as adding machines and 10-key machines are calculators designed for the office. If you are a professional accountant, CEO, auditor, tax preparer, or supervisor, chances are you operate these machines at least once in a while if not every day. The Sharp EL-1750V printing calculator is pictured below. This blog entry will show you how to extend the operation of the printing calculator beyond the mere adding and subtracting. While a printing calculator may not be a weapon of choice for super advanced mathematics, we can use some of the features to do some cool arithmetic and algebraic problems. Amaze your office friends with these techniques! You have a printing office calculator if you have keys such as +=, -=, *T, ♢S, and GT. The printing calculator operates on a hybrid notation. Addition and subtraction operate by postfix notation. That is, enter the number, then press the + key or - key, and repeat. Addition and subtraction operations are terminated by a totals key, labeled *, *T, or */T. For this blog entry, I will use *T to symbolize the totals key. Keystrokes will be in blue and Courier font. Multiplication and division operate by infix notation. This is enter the first number, press either the × or the ÷ key, then enter the second number. Multiplying and dividing operations are terminated by the equals key. The equals key can be by itself (=) or coupled by a plus or minus operation (+= or -=). MT or M* : Recalls the contents of the memory register AND resets the memory register to 0. For this blog entry, I will use the M ♢ and M* notation. It is often a very good idea to "clear memory" first by pressing M* before doing several of the more complex calculations. Now that you have it, let's go on to the arithmetic calculations. Paper printing is optional but unless you have ton of tape, it is not really necessary. 1. Make sure memory is clear before beginning (necessary most of the time). 2. If you remember "My Dear Aunt Sally" (multiplication and division before adding and subtracting), the rules of parenthesis, and the rules involving rational expressions, we're in business. See, algebra class pays off! 3. Do not forget to terminate adding/subtracting calculations with *T before switching to multiplying/dividing. 4. Likewise, do not forget to terminate multiplying/dividing calculations with = before switching to adding/subtracting. Before starting the adding/subtracting, press the + key once to tell the printing calculator to add the number. Let's begin. I use the capital letters A, B, C, etc. to represent numbers (as variables). Here is where the memory keys get used. If you have to switch signs (i.e. negate a value), remember to use the plus/minus key +/- . Example 2: A bill with sales tax. Be sure to work with memory when you adding and subtracting fractions. You will get an answer in decimal format, no matter how nice your fractions are. Let A be the cost of the item and B be the selling price. Example: If the cost of an item is $3,200 and the selling price is $4,800, what is the margin? It looks like the Cost/Sell/Margin equation above. We can use the Cost/Sell/Margin and the change sign (+/-) to calculate Δ%. Let A be the old number and B be the new number. Example: Find the percent change from 17.95 to 24.65. 17.95 is the old number, 24.65 is the new number. The reciprocal of A is 1 ÷ A. We can use straight division, memory, or a third technique which can be useful in more complex calculations. 2. Press the × key N-1 times. 3. Press the = key. To square A, press A × =. To cube A, press A × × =. For practical purposes, N should not be too high, unless you want to press × many times while keeping a mental count. If N is negative, follow the power calculation with a reciprocal calculation. See Example 2. 1. Start with an initial guess x0. Obviously, the better the initial guess, the faster this method goes. 3. As you repeat Step 2, more and more decimal places should "repeat" themselves. For each loop, set x1 as the new x0. An awesome page about leases, thanks tvmcalcs.com! This blog entry is dedicated to Namir Shammas, who just became a grandfather. Greetings everyone! 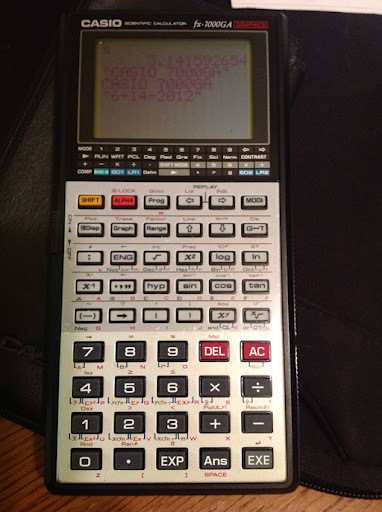 Recently I spent a week programming on an absolute beauty: the HP 71B calculator from Hewlett Packard. The calculator was manufactured during the mid 1980s, has a memory of over 16,000 bytes and four slots for software pacs or ROM PACs (cartridges). Currently I do not have any cartridges for the 71B at this time. One cartridge gives the user access to the FORTH programming language on the 71B, which allows for the 71B to operate in RPN (Reverse Polish Notation) mode. Here is a video by AshLeaFen on 41 Translator ROM PAC on the 71B. I won this calculator as a door prize, believe it or not, at a calculator convention last year. Assigning a variable: I could use either a LET statement or just use the equals key by itself. This trick works with line numbers only as I understand it. I think preceding every line with line numbers is a lost art. While there may no longer be a need for them in today's languages, line numbers do give an order or structure to the program. The HP 33S and 35S programming calculators (also made by Hewlett Packard) keeps this tradition alive, except that line numbers are structured. Below the picture of it are several of the programs I made over the last week. When it is not used, the 71B is stored in a Kindle case. This program uses the 71B's internal clock to make a countdown timer. 80 DISP "Done, check L."
The program generates a list of random integers from 1 to N. I have the 71B set the random seed to current time. Since this program leaves L as an array, if you want to use L as another variable, you probably have to execute DESTROY L first. This is your basic arithmetic with complex numbers. The ON variable GOTO structure allows you to assign various GOTO commands in one line based on the value of variable. Where will the out of control θ end up? This program gives the determinant, and if it exists (det M ≠ 0), the inverse of a 2x2 matrix. A program for horizontal curves (engineering). These programs calculate the sum of a function and the numeric derivative of a function, respectively. Line 10 is where you have to define your function (of X). That concludes my blog entry for today. P.S. 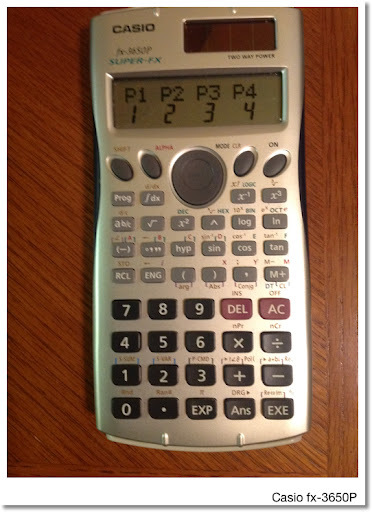 Hewlett Packard, when will the HP 39gii calculator be on sale in the United States? Thanks!